After Marcelino transferred to Valencia, Quique Setien to Real Betis, Juan Carlos Unzue to Celta de Vigo, and Eduardo Berizzo to Sevilla, La Liga was set for a brilliant, innovative, tactical season. The active transfer market for coaches in Spain would have an immense impact on La Liga, and it’s safe to say that such impacts can already be seen. Prior to now, La Liga had always had incredible coaches. The only difference is that now more and more quality coaches fill in the positions in lower league teams, making it interesting to watch any match in the bottom half of the table. Real Betis, at the moment, are undergoing one of the most interesting campaigns in Europe. Upon philosophical manager Quique Setien’s arrival in summer, Real Betis added many crucial signings that took the team a step above. They have since beaten Real Madrid at the Bernabeu and are off to a fantastic start in the league, gaining the attention from Football Twitter after regularly scoring from playing from the back, conducting long possessions, and practising beautiful positional play. Eusebio Sacristan aligned his usual possession-based 4-3-3, with Juanmi and Llorente finding a place in the starting lineup. Oyarzabal switched wings, playing on the right. Real Betis also commenced with a possession-based 4-3-3, Quique Setien’s signature formation. Both central midfielders, Guardado and Fabian, played a pivotal role in possession for ‘los Verde-Blanco’s’, orchestrating every play. In-form Sanabria played up top, with Sergio Leon surprisingly starting on the bench. From the beginning of the match, one thing was evident: Real aimed to win the ball back high up the pitch against Betis. The visitor’s style of play invites others to high press them, however doing so can be complicated because Setien moves his pieces very strategically. Two variations of presses were a constant for Real Sociedad during the first quarter of the match: their high press and their counter-press. As shown, Real aligned a 4-4-2 mid-block when Betis had the ball in their half. After watching them for quite a while, rarely do they ever align this innovative 4-4-2. They intended to form a 3-2 side formation to overload Betis’ left side. Again, knowing that Mandi, Guardado and Fabian are the most comfortable on the ball, they invited Betis to play to their left most of the time. Real Soc. wanted Feddal and Javi Garcia participating as much as possible in build-up play from the initial third. The video shows how they constantly give space to Javi Garcia, tempting Betis to play the CDM. As shown, Real intensively press Betis near their right back area when Oyarzabal loses the ball. They aim to obstruct Betis from getting comfortable and playing safely out of the back by covering every near option. Illaramendi played a crucial role in their counter-press, always providing himself as back-up for any destination the ball might take to beat his team’s press. Here is an illustration of Betis’ formation when Real Sociedad had the ball. They placed their 4 defenders in a narrow line, with both wide midfielders playing in a similar location as wing-backs. Their role, however, was not as such. As shown, all 3 midfielders play very separately, with the front three forming a 2-1 triangle to invite Real to play towards the wing. Below, a video explaining this, and how they ranged from a 4-5-1 when the ball was in Llorente or Navas’ possession, with Javi Garcia leading the press in the midfield. After watching this video, it is now clear why Setien plays his 3-man midfield so spread apart. With the triangle formed up top with the 2-1, the line of 3 formed by the striker, right attacker, and right midfielder block Real Sociedad from entering Betis’ half comfortably. The video shows how Betis patiently knock the ball around until they find the perfect moment to play a penetrative pass to their central midfielders. Then, they placed players near the edge of the box to create a dangerous situation from either a long shot, a through ball, a cross, or simply for ball circulation. As explained, the four highlighted players’ positioning means that they knew they were looking for long balls once the centre backs received the ball. Due to this, Zurutuza was seen higher up the pitch than usual, rather than closer to Illaramendi, Navas, and Kevin Rodriguez. The first half ended with a 2-2 draw. Real Betis opened the scoring just 6 minutes in, after Sanabria performed a cool finish to beat Rulli. Willian Jose levelled the score with the goal analyzed above. Mikel Oyarzabal and Feddal scored each team’s remaining goal in the term, as both teams entered the second half with quicker transitions and more direct passes. Having Tello and Joaquin positioned deeper allowed Betis to transition quicker. It gave them verticality, and a quality press from both astute midfielders. Like in Joaquin’s goal above, both wingers performed forward runs upon winning possession. When this happened, Betis tried to get the ball to either Joaquin or Fabian, who then looked to play penetrative passes to any of the two making direct runs into the box. These 2 clips merely show how simple long-balls can truly complicate high defensive lines, especially from two teams that struggle to defend in compact structures. Eusebio Sacristan hasn’t fully discovered the proper way to create a compact low-block. His side looks very inconsistent in their defensive strategy this 2017/2018 campaign. As for Setien, he has always been an attacking minded manager. His defensive understanding of the game, however, has shown significant signs of improvement when compared to last years’ Las Palmas. For most corners from the left side, Betis aligned a diagonal line of 5 to block any crosses from a variety of angles. The 3 initial players of the line, plus 2 supporting players, guarded any first post crosses. Real struggled to beat Betis with any cross to the first post, so they adjusted their corner kick strategy late in the match. Two players performed distracting runs to the first post, while Zurutuza stood in the way of Llorente and the rest of the defenders, blocking them from reaching the young centre back. Real Sociedad’s ability to adjust to Real Betis’ defensive corner strategy allowed them to manage a late equalizer in the match. Same as the first half, the second half contained two goals apiece for each side. Both sides opted for beautiful positional play, tempo variations, interesting high presses and many goals. The match ended 4-4, as Anoeta fans got to see an 8-goal thriller that ended in a draw. These pass maps created by @Ben8t say a lot about the match. For starters, it shows both centre backs participated equally in build-up from the back, showing Real Sociedad’s players comfort on the ball. Odriozola and Kevin Rod. also are shown extremely high up the pitch, illustrating their important roles in attack. Illaramendi connects the whole team, with Zurutuza playing beside him and helping him with build up possessions. Oyarzabal played on the right, compared to his usual left spot, while Xabi Prieto drifted right as always. The map also shows more pass combination and activity on the right, as Oyarzabal, Xabi Prieto Illarramendi and Odriozola have many pass combination lines between them. 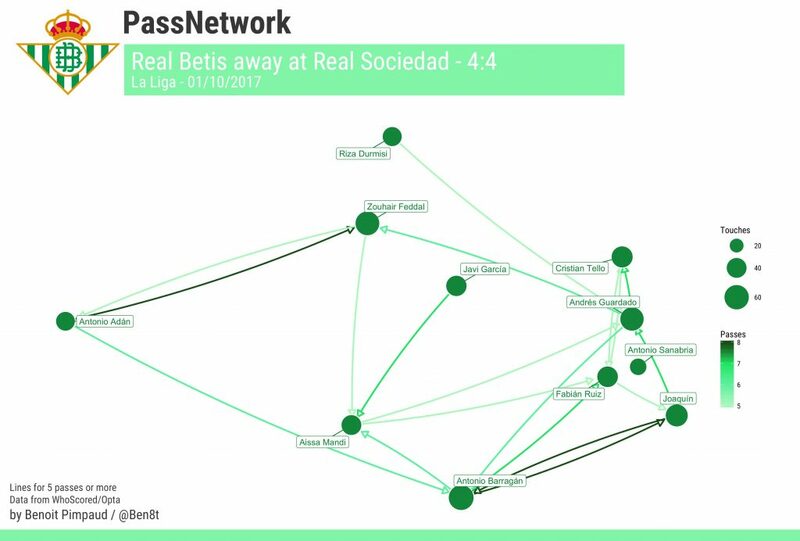 Real Betis’ pass map showed a direct correlation with the first section in this article, Real Sociedad’s high press. As shown, Feddal has more touches on the ball, yet way fewer pass combinations. While Mandi was involved in fewer touches but was responsible for all build-up from the back. This illustrates Real’s high press strategy to leave Feddal and Javi Garcia with more time on the ball, to obligate them to get more touches on the ball. Both centre midfielders also play much more advanced than Real’s midfielders. Guardado drifted centrally, participating through the central axis quite often. Durmisi had less attacking presence than usual. The highest pass combination was between Joaquin and Barragan, showing their constant collaborative qualities. This chess-battle between Eusebio Sacristan and Quique Setien left for a lot of analysis. Ranging from high-presses to quick and slow transitions, both teams showed impressive tactics that have led them to their positive starts in La Liga. Real Sociedad are still showing defensive problems, however their dominance in attack helps them balance out important points. Struggling results after their impressive start has Real 8th with 10 points. Real Betis remarkably have 13 points in La Liga, placing them in European football for now. Both teams shall be further analyzed across the season to see any changes, improvements, and tactical trends Eusebio and Quique have for the world of football analytics.